Hey Lawyers! More than 1,000 hours of legal research–or, feel free to do it yourself. Here at Restaurant Expert Witness, we wrote the book on safety in the Restaurant Industry. 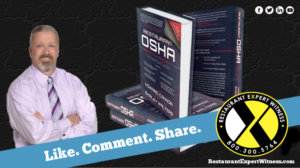 Restaurant OSHA Safety and Security is packed with more than 1,000 hours of research backed by Howard Cannon’s more than 30 years of experience. You could do the research yourself, or you could let us make your job a little easier. Give us a call today at 800.300.5764 for a free consultation to discuss your Restaurant and Bar Industry matter!